Can you Kente? Yes we Can! 24 May Can you Kente? Yes we Can! This morning we went down to the market and haggled with some tro tro drivers to guide us around for the day. We wanted to get out of town and explore some new sites. Since the 12 of us would fill up a whole vehicle anyways, we figured it would be easier, and potentially cheaper, to just hire the driver for the day – plus how super awesome is it to crank Azonto music in your own tro-tro filled with Obrunis (foreigners/white people). So this is what we did. 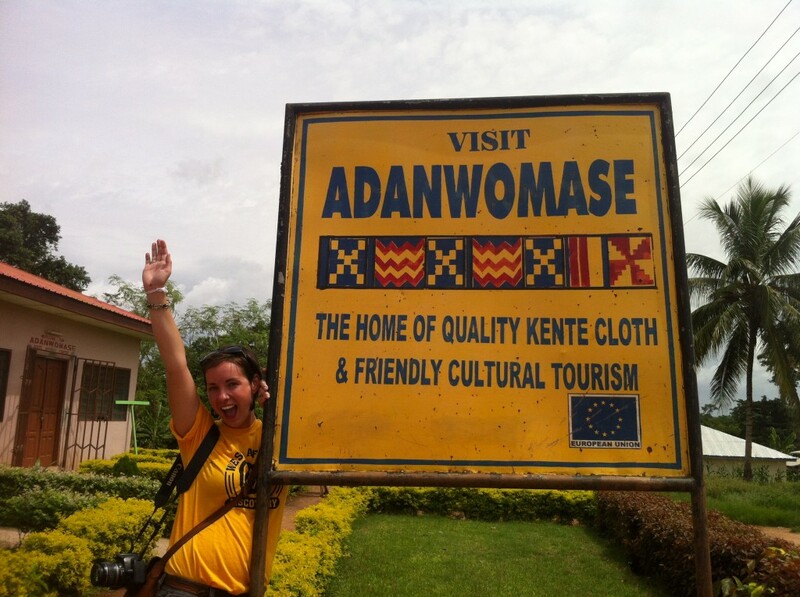 We drove about 20 km outside of Kumasi to a village called Adanwomase, which is near the town of Bonwire. The village is home to an eco-tourism hub developed a few years ago by Peace Corp volunteers to teach tourists about the traditions and history of Ashanti Kente weaving. The destination is now run by locals and offers a tour of the village – including a visit to the chiefs palace, a shrine and a small cocoa farm as well as a separate tour including the history of Kente weaving, its traditional value, how the cloth is made, spun and actually weaved. Participants learned how to weave Kente cloth. It's a complicated process that involves all of your fingers and toes hard at work. We learned the meaning of the different patterns – for example, one represents sympathy, another means ‘life is not straight’, one represents wealth and superiority – and our group actually got to give the weaving a go. It was completely awesome and so therapeutic! I do have to say, our speed was not anywhere close to par with the locals, our pattern was non existent (we did one solid colour) and the details, well you could tell we were first-timers, but it was an incredible experience. We learned that in the Ashanti tradition, woman are the farmers and the men are the weavers which differs from other regions and tribes, like the Ewe in the Volta for example. And we got some incredible information on the importance of cocoa farming for the Ghanaian economy. 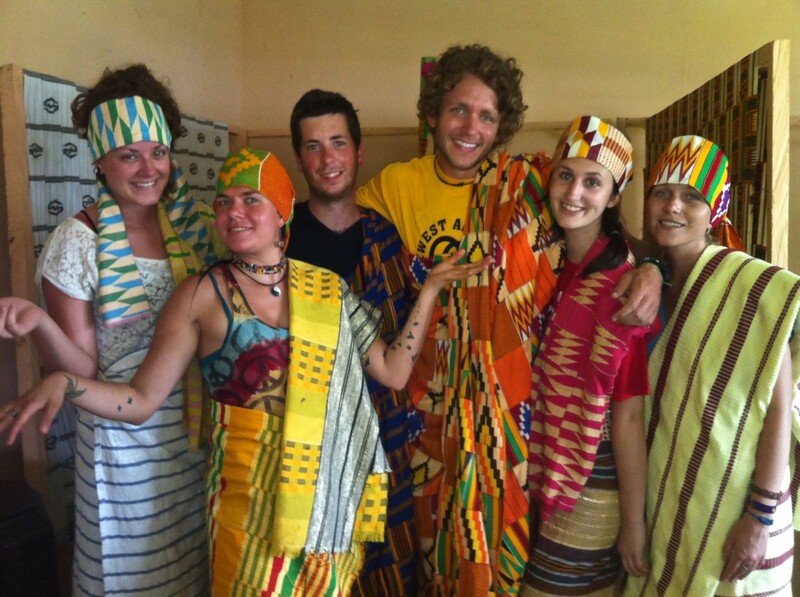 Once our tours were complete, we got to try on the different kente clothes and dress up like Chiefs and Queen Mothers. The West Africa Discovery team looks lovely, adorned in bright kente cloth. BB even looks the part of a Queen Mother. After our goodbyes, our guide Eric, told us about 15 minutes down the road there was a spot where we could go and learn about Adinkra symbols – which are the tradition symbols representing different meanings. Adinkra is composed of two local words put together roughly meaning a message from the past. Originally, Adinkra symbols were used to communicate with the deceased and were stamped onto cloth to be worn at the funeral. Some represent strength, feminine beauty, going back to your roots, adaptability, wealth, and more – there are over 120 different Adinkra symbols. Our guide, David, taught us about the cultural value, what some of the different symbols mean and when they would be used. He showed us how they create ink from the bark of a tree by pounding it (it takes him up to 8 hours to do so, he said it would take us the rest of our lives. He was funny, but probably right). Then David showed us the different stamps made out of calabash, which is a type of local gourd, and demonstrated pressing it onto cloth. Jeremy, BB, Andrea and I paid 2 cedis to get a symbol on our clothes, lol, which was super awesome! 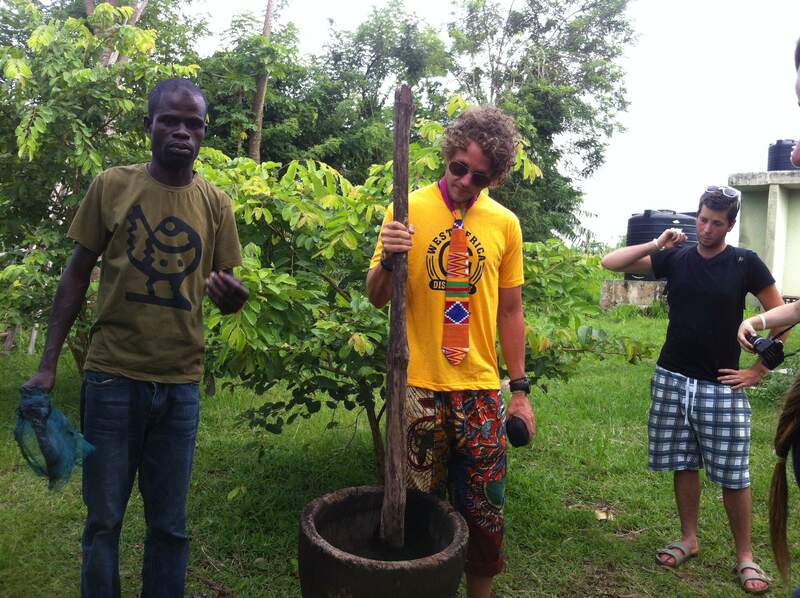 Jeremy pounding bark to make the ink for the Adinkra crafts. The drive was beautiful and it was a great opportunity to learn more about the Ashanti tradition while going through some team building activities. We also got some great participant and trip leader sleep in on the drive back to town. – We are leaving Kumasi today to head north towards Sandema, it’s a 10 hour drive and I can’t wait to see what kind of sleeping shots we get out this one! !